We get a ton of questions from folks about when the ideal time to move to coworking spaces is. Is it really early on in your business, when you don't have a ton set up, and will do well with flexibility? Is it later on, when you're established and can best take advantage of the constant networking opportunities? There's a few things to consider! Coworking spaces allow your business to have constant exposure. There are always new people coming through the space, whether they're new members, folks touring through, coming for events, working out of the space for the day, or just visiting other members. The influx of people gives you the opportunity to put your business, your ideas, and even your employees out there. You'll have a building full of professionals at your fingertips, and what you do with it is entirely up to you. The community in a shared office is sometimes looked past, but without a doubt the most beneficial part of coworking. Don't have a business yet? Coworking spaces are perfect for early stage entreprenuers. You don't need to go it alone, and coworking spaces have a community of other people that have stood in your shoes before and know that your next steps should be. Can your business benefit from a flexible commitment? While most commercial spaces require a lease of at least a year, coworking spaces are designed to be flexible for businesses of all sizes. We understand that your business may be expanding rapidly, maybe you won a new contract and need to hire a couple of people next week. Or maybe you need to shrink a bit, your recent contracts have ended and your contractors aren't staying on with you. Good news! You're not locked into a year contract with a preset space. With thirty days notice, you can grow into an available private office, or shrink down to just a private desk. This flexibility will allow you to pivot quickly and get the most out of your money, while maintaining a home for your company and consistency for your clients. While the commitment is flexible, coworking spaces are designed to allow your business to stay for years, and truly create a home within the space. Does your company want a professional 'face'? 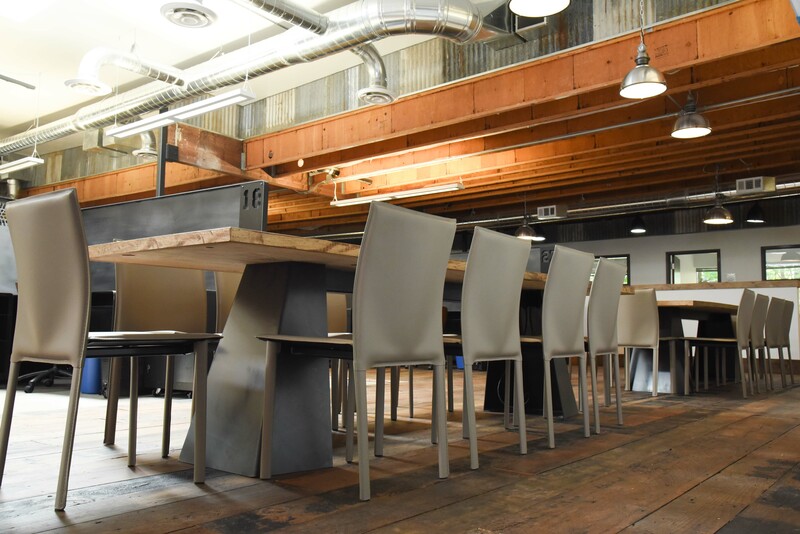 Whether you're hiring your first hire, holding meetings, or just need a business address - a coworking space is an inexpensive way to bring your venture to the next level. Here at Urban Office, your membership will give you access to a gym, bar space, kitchen, professional conference rooms, business address, receptionist, and more. As a small business - most people don't dream of having these things. When you're meeting with investors, or potential partners, being in a space that reflects your business' prestige goes a long way in creating trust between you and any potential business connection. When it comes to hiring talent, being in a space like ours makes you competitive with the large corporations that will build these things into their office buildings. You won't need to worry about losing great talent because your business is too young to afford a weekly happy hour, or to small to have social opportunities for your first hires. We've got you covered. Think a coworking space is a good idea? Contact our team to find the perfect space for you.